I will be going to Washington DC on a bus from Duluth, Minnesota. There are two full buses of women traveling by bus who will sleep and eat on the bus to make our voices heard. We could have filled a third bus but the company could not find enough buses for those interested. In addition to the two full buses ( about 106 riders) there is another bus sponsored by a different group and a large group who are flying to DC. 8 buses are traveling from the Twin Cities area as well. There are now 1800 buses registered to arrive at RFK stadium Saturday morning and at least 200,000 who will be in DC to make sure the incoming President @realDonaldTrump understands that we will not sit back and allow issues that affect women and children to be weakened and eliminated. Why are we willing to sleep for 2 nights on a bus with other like minded women? Each person on the bus will have their own reason to march. We march in solidarity with women concerned about the many issues that will be under attack starting on Jan. 20th. We are concerned and even alarmed at the campaign rhetoric and now the rhetoric of a man who will be our next President. We know that we must raise our voices to let the incoming administration hear our message about women’s rights and all we have held dear and worked for over the last 8 years. Progress was made. We don’t want it to be taken away. I march in memory of my beautiful sister, whose shooting death in a domestic shooting almost 25 years ago now has left a vacuum in my life and a burning passion to prevent gun violence. Unfortunately Congress and elected leaders have been working on opposing life saving measures like Brady background checks, public health and safety education about guns, safe storage, stopping bad apple gun dealers, and ways to keep women and our communities safer from gun violence. And yet the myth that guns make women safer persists. Myths will prevail when the corporate gun lobby takes a seat at the table of the incoming President. Governing by myth will make us less safe. 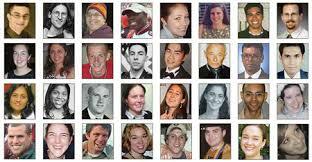 90 Americans a day die from gunshot injuries from homicides, suicides and accidental discharges. Women, children, young black men, older white men, toddlers, everyone. Everyone is at risk if we weaken our gun laws even more under the new administration. We will march because women play an integral role in keeping their communities and their children safe from devastating gun violence. My sister’s story is the story of many women across America. It is the story that we shouldn’t have to tell but we are a reluctant group of members of a club of families of gun violence victims. We are victims. We are survivors. We will be marching for common sense. I have met many people who have marched, lobbied, advocated for, organized for, pleaded for, cried for, written about, been interviewed about a lost loved one and for stronger gun laws that could save lives. They know that passing stronger laws can save lives. Rachael and I and many others will march in DC and cities all over America ( and the world for that matter) to demand that our elected officials do something to cut gun deaths in half by 2025. It can be done. Will they have the will? Will they find the way? We are concerned that a new administration and Congress will not only not have the will but will make us less safe by weakening our gun laws. Rachael’s aunt would be proud of her niece’s activism and advocacy. In memory of Shelley and Barbara. We will march and we will not forget. Where do they come from- those guns that felons get their hands on? Felons cannot legally buy guns from federally licensed gun dealers. It’s the law. Guns don’t fall from the sky. They come from someone or somewhere that shouldn’t be giving a gun to a felon. And felons know they cannot possess firearms. I have talked to a few people who are now ex-felons and they told me they understand that as one of the things they cannot do upon their release and going “off paper”. Shouldn’t we stop felons from getting their hands on guns? Of course. That is a no brainer. I can’t imagine anyone saying no. But no they say when the lapdogs of the corporate gun lobby refuse to pass stronger gun laws to keep the guns from these and other people who shouldn’t have guns. Requiring Brady background checks on all gun sales can save lives. Requiring the reporting of lost and stolen guns can save lives. Cracking down on bad apple gun dealers can save lives. Requiring people to lock up their guns can save lives. Stopping gun trafficking can save lives. Talking sense to people who think their friend or family member won’t do anything wrong with the gun they gave or sold to them would save lives. So, on New Year’s Eve there was a deadly shooting in my neck of the woods. Two brothers were shot, one died and the other badly injured. Who shot them? Allegedly a felon in possession of a gun he couldn’t have had legally. As of today, a man has been arrested with having this illegal gun at the scene of the crime but not yet officially charged with the actual shooting. More news to come, I’m sure. Where did he get his gun? A woman in the home broke up the altercation, and the younger man reported to deputies that he was scared at the time of the incident and believed Kludt was capable of hurting or killing him. The victim then told deputies about approximately 25 guns stored on the property. Children in the residence confirmed that fact, and the woman gave consent to search the property. Deputies seized two pistols from Kludt’s home office — a.45-caliber Glock and a 9mm Beretta — before locating a gun vault in Kludt’s garage that contained 32 total firearms. Searches of a garage attachment and pole building elicited a second vault containing another 9mm Beretta and other guns. Multiple other firearms were found throughout the property, including muzzleloaders and antique firearms. Not all firearms were seized; several were secured on the residence after a family member claimed possession and ownership of them. Where did he get this arsenal? It sounds like his family was scared of him. I wonder why? There really are people who shouldn’t have guns. We need to regulate the people who are potentially dangerous with guns. There are many responsible gun owners would not intentionally hurt someone with that ( until they do as in my sister’s case). Many guns are never fired or used in a crime. That’s all good. What is not good is the few who make the wrong decision. Stronger laws can help us all make the decision that guns are not for everyone. With the gun death rate staying the same or rising in the past 5 years or so, we are not doing enough to protect people from senseless gun deaths. It is a public health and safety crisis ignored. We can save lives if we choose to and if the gun lobby lapdogs would represent the majority of American who want them to do something about the carnage. Happy 2017 everyone. I have been avoiding the fact that in just few short weeks, @realDonaldTrump will become our next President. And so I have also been avoiding other things in my life as I grapple with what is going on around me. Time has flown already since the New Year’s holiday. Family time and taking care of things for a relative who has a disability has not allowed me to think much about the new year. But I was drawn back in upon seeing some tweets and Facebook posts about shootings around the new year. It happens every year and, as I have written many times, gun violence does not take a holiday. In spite of those facts, Congress and legislatures in many states, controlled by gun lobby lapdogs, will disappoint us with their resolutions to loosen laws that save lives and prevent shootings. Let’s start with the Texas lawmaker who was the victim of celebratory gunfire on New Year’s Eve. Every year, irresponsible gun owners and carriers don’t think about the great risk to others when they decide to shoot loaded guns into the air. Bullets, as we know, have certain trajectories and so when they go up, the natural physics is that they come back down. Whoever or whatever happens to be under the trajectory will be hit. “If my legislation could help save a life, you know, then definitely that’s what we’re gonna be looking at doing,” the Weslaco Democrat said Monday in a phone interview from the Valley Baptist Medical Center shortly before he was released. That’s what I’m talking about- saving a life ( or lives). Is there something bad about that? When people are affected by gun violence, it often changes things and makes them realize that this could happen to anyone. Common sense is what it takes to save lives and keep citizens safe from gun violence. I got maybe a half-block away from my Grandmother’s home before a “Celebratory bullet” pierced my skull. Better yet, when my cousin Jeff ran back in the house to report to an adult to call 911, “Joe’s just lying on the ground, everyone must have thought I was joking”, but a child with a bullet-hole in the top of his cranium, when my parents (and aunts, uncles, and fellow cousins) were all trying to figure out what happened to me, crazy scenarios started to be heard. When police searched the rooftops in a few block radius a day later, they found over 700 spent bullets! When everyone at the party figured out my condition, they along with the medical staff at Children’s Hospital of Philadelphia (CHOP) must have all figured I was dead. You know you’re a dead man when the hospital has a priest sitting with your parents in the Emergency Room to wait for bad news. Joe was 11 when this happened. When I met him years ago at a national meeting he was sitting in a wheel chair with obvious physical disabilities. We have remained friends for years. 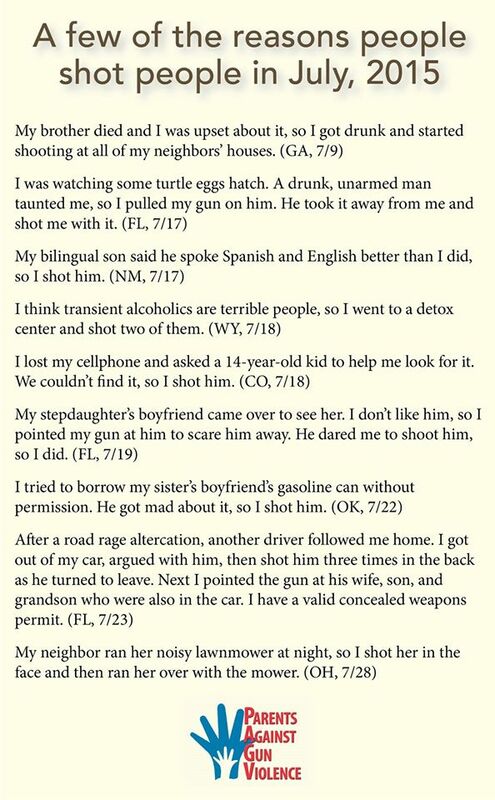 Real stories are worth many gun lobby myths. Closer to home, several things happened in Minnesota. Two men from the Twin Cities area were shot behind a local Superior, Wisconsin bar. One died in the shooting and one was injured. It was not random. Most shootings are not in fact. The Minnesota Department of Public Safety announced rather quietly that more states were added to the list of those whose carry permits would not be reciprocated in Minnesota. Why? Not strong enough regulations in Ohio, Tennessee, Oklahoma and Arkansas. Now there is some common sense. If anyone can honestly tell me that it is safe for teens under 21 and those without permits to carry will be safe on our streets, then they are not using common sense. For in Minnesota, that is what we have decided we want people to have training and have a permit and be 21. Why would we allow less than that anywhere? Follow the money and the links between the gun lobby which pushes bills to allow anyone to buy and carry guns and the gun industry profits. And speaking of the gun industry, it looks like gun stocks are falling after the election of the gun lobby’s candidate, Donald Trump. @realDonaldTrump won’t take guns away so no worries- except that people won’t flock to gun stores to buy guns now unless they are afraid of the fear of a President who will confiscate their guns. Now what? Looser laws that will create new markets for deadly weapons. Of course, Hillary Clinton was not going to take guns away either but the gun lobby said she was. President Obama did not take guns away but the gun lobby said he would. Don’t believe the gun lobby. Speaking of taking guns away, Congress and the Minnesota state legislatures are back in session. The gun lobby will be busy convincing Congress and state legislators that more guns are needed by more people to keep them safe. They are wrong, according to the facts and reality. But never mind the truth. As I have written before in a previous post, up is down and black is white. As Mark Twain once said, ” “No man’s life, liberty, or property are safe while the legislature is in session.”” That is more true today than ever. One of the first orders of business in the Republican led House ( aside from the insane ethics debacle) was to introduce a measure to fine any House member who live streams from the House floor. Republicans didn’t like it when Rep. John Lewis and other Democrats staged a sit-in last June to ask for a vote on background checks. Now they want to silence members who don’t share the views of the gun lobby lapdogs but rather the majority of Americans. Shame on them. But they have no shame. They would rather punish opposing views than save lives apparently. But thankfully there are some in Congress who are not afraid of the gun lobby. Massachusetts Senator Ed Markey will re-introduce a bill to allow government agencies to do research on the public health crisis of gun violence. We will see a lot of gun bills going both ways but the conservatives, Republican lapdogs for the gun lobby and those who are afraid to stand against that group are giddy with the idea that they can weaken gun laws and allow more dangerous behavior with guns than ever before. For the life of my sister, I can’t understand this glee at weakening laws that save lives. People will die as a result. Will that matter to these lapdogs? Does it matter to them that one toddler a week has shot someone in 2015 and now 2016? If not, why not? Avoiding the truth means avoiding the facts that these kinds of shootings are avoidable. Maybe if one of their own is struck down by a stray bullet or shot by a crazed or angry person or a toddler who shouldn’t have had a gun in the first place ( when it could have been prevented) one or two of them will realize how wrong they have been. It will be a busy few months (years). Let’s hope we can keep the pressure on this issue and shed light on those who take money from the nation’s most powerful lobby- the NRA. 1Pulse4America is keeping track. It is not a pretty picture. When North Carolina Senator Burr takes over $800,000 from the NRA in “blood money” we can count on him to oppose common sense gun legislation that could save lives. For if a legislator or Congress member is beholden to the gun lobby, we are less safe as a result. Facts matter. Accountability matters. Lives matter more than anything else. Happy New Year everyone. I resolve to do whatever it takes to prevent gun violence and save lives. How about you?